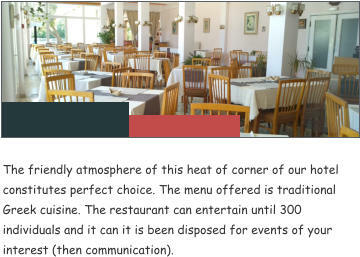 Restaurant The friendly atmosphere of this heat of corner of our hotel constitutes perfect choice. Τhe menu offered is traditional Greek cuisine. The restaurant can entertain until 300 individuals and it can it is been disposed for events of your interest (then communication). 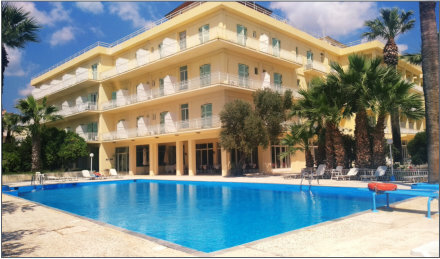 Pool bar In the big garden of our hotel, dominates the swimming-pool with sea water. That is ideal in order to you relaxed and you enjoy your coffee or your drink. Conference room (Coming Soon) Our hotel has a meeting room for business meetings or any other event. The room can accommodate up to 50 people, has audiovisual media. We can offer coffee breaks as well as catering service. Game Room (Coming Soon) Our hotel has a game room. Υou can play American billiards (2 tables), as well as electronic games.